Yeah I’ve got the T shirt too that says that… but St Francis actually did not say those exact words… though it is attributed to him… it was an idea that he portrayed in how he lived. BEING Christ to everyone. LIVING the gospel in the secular world… And that is how I am “trying” to live… preaching the gospel with my life. But how am I doing with that? Huh. I am TRYING…. But am I trying hard enough? When people watch me, listen to me, read what I write do they see Jesus in me, or do they sometimes see the old, obnoxious, foul-mouthed wild woman I once was? BEING a Christian is hard work. Trying to LIVE it is at times impossible for me… being a silly human who tends to be sarcastic and wants to be right, cool and witty all the time. About a week ago the old me reared her ugly head… at work a couple of co-workers were asking another case coordinator if it is okay to have a preposition (with) at the end of a sentence (grammar Nazi….NO of course not! )… with an evil grin, the old me took control of my brain (quite easily I must admit), spun around … spouting the old joke of fixing the sentence with a comma and the word “@$$hole” … yes I said that. Eyes popped, laughter ensued and one commented, “I like the way you think!” hahahaha… O.o … Then the co-worker who sits behind me, who sees all the religious stuff I wear and have littered about my desk and walls said, “You are too funny. You have all these crosses and then you say something like that!”…. Dagnabit. There she goes again. Rearing her ugly head. The old me. I then had to explain to her (yes I did. I HAD to explain!!!) the old me. Who I once was and how she sometimes breaks free and just pops out of my mouth. But really at this point I should have her in check. If I am serious about BEING a Catholic in word and deed I should NOT be spouting foul phrases…even though they are humorous… I should be THINNKING before I speak. I should be thinking… “Would Jesus like what I am about to say?” … um. Nope. But no. I am impulsive… ugh. I need to control myself. Maybe that is what I should work on this year. 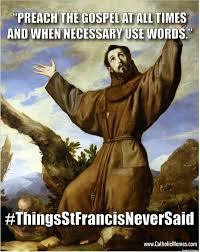 I should try HARDER at BEING the Secular Franciscan I am supposed to be. In a world where swearing is now the cool norm (I tried watching the hit comedy “The Heat” last night… had to turn it off… what utter rubbish!) … I need to be better than that… I do not need to be “cool” in that way anymore. I need to be cool… in a different way… wait… hm… do I even NEED to be cool anymore…? Huh. I personally think being Catholic is cool… but do I need to exude coolness at all? Do I care if I am cool? SHOULD I care if I am cool? … The simple answer: NO.I should be meek and humble …and kind amongst all the obnoxiousness of this world … that is true bravery. TRUE COOLNESS: To be courageous in my Catholic meekness… to be and live simple love and joy in a world gone mad… to not give in to obnoxious frivolity ….